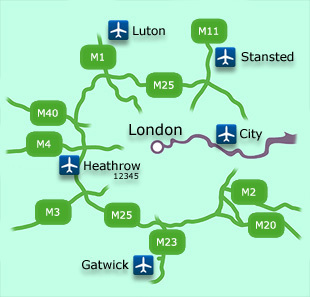 Cavendish Cars have a long history of delivering passengers to Heathrow, Gatwick, London City, Stansted and Luton airports. Our prices are competitively priced and usually much cheaper than a traditional taxi. Please note all online bookings must be made at least 24 hours in advance of your journey. For all bookings that require less than 24 hours notice please call our office on the numbers above. Please check the details you enter thoroughly before sending the form to us, however we will contact you to verify all details, so no need to worry!